Looking for the best bass spinning reel under 100 bucks? You are absolutely in the right place, we are going to show you the finest spinning reels under 100 $. When its harder to score a bite, its better to equip lighter lures, lines and spinning reels. Some folks find it too robust, but it is a smarter way to bag some bass. We reviewed and placed 9 best bass spinning reel under 100 $. Our priority is to provide you with premium reels that compliment a reasonable price. if you are also looking for a reliable spinning reel compatible rod, check out our best bass fishing rod for the money. Here you will also find a little over half a dozen quality rods. If you are looking for more spinning reel related products, you are in the right place. Bass fishing is extremely popular in North America, it’s the game fish which many anglers obsessed with. And catching bass is challenging enough to make it more popular. Bass fishing techniques changes with temperature fluctuations. This fact made it more challenging but the moment it bites your hook, we can experience their aggressiveness. Sometimes with a topwater lure, they come to the top to grab the lure which is a great scene to watch. Bass fishing and other related fishing needs a medium heavy fast action fishing rod along with a minimum gear ratio of 5:1 spinning reel. You can also fish with a baitcaster, but if you just started fishing then spinning reel is the best option you got. Want to know why spinning reel gained a lot of popularity? Find out below. Wanna know which reel took the best spinning reel title 2018? It’s Okuma Safina Pro Spinning Reel. If you want bang for your buck, check out the Okuma Trio High-Speed Spinning Reel. 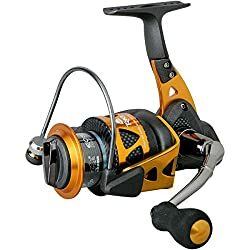 It is also the best spinning reel under 50 $. 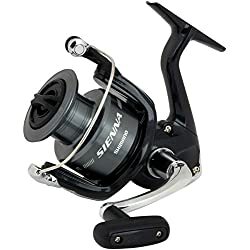 Description: Introducing you SHIMANO Sienna FE series, they say it’s a freshwater spinning reel but with a little care, it can be a great reel for freshwater to inshore fishing. They offered 4 sizes which are 500FE, 1000FE, 2500FE and 4000FE. It’s a gem, I must say folks! Wanna know why? Let’s find out the reasons. It’s a spinning reel made for these days, a fully upgraded version from the Shimano factory in Malaysia. In this upgraded version, they introduced the angler folks with a new M-Compact Body, what it exactly does moves the oscillation gear closer to the rod that greatly improves the balance of the reel. So it’s a fine one for handling, even arm fatigues are lessened because of this mechanism. Go for bass fishing for a longer period of time and at the end of the day, feel no arm fatigue. Great isn’t it! It offers a propulsion line management system, birds nest or backlash is a common issue between the novice anglers and this line management system greatly reduce the chances of backlashing and provides longer casting distances. Another awesome technology they added here is Super Stopper II technology which is for instant anti-reverse with no back play as well as Dyna-Balance which minuses the wobble during the retrieve by counterbalancing the rotor. It greatly increases the sensitivity and smoothness. An essential feature for bass fishing specifically. This 9.2 oz weighted spinning reel gives you 9 pounds of drag, the handle can be switched into both side like all other typical spinning reels retrieval out there. The line capacity is great at this price actually I would say! Line capacity (6# mono) 200 yards and 1+1 ball bearing. That means it has 1bb and 1rb. Don’t be confused with the number, it’s pretty smooth. Now let’s talk about gear ratio, well it gives a pretty decent gear ratio which is 5:1, recovers 28” per turn. Its a standard gear ratio for bass fishing and all other freshwater fishing like panfish, catfish, trouts etc. if you planning for inshore fishing feel free to use it, just remember to clean it with a garden hose everytime you fish with it! Last but not least, it’s a piece of gem, really a great spinning reel for bass fishing. It fulfills all the criteria completely that a bass fishing reel should have. Such a wonderful reel in this price, great deal what I can say! Description: Looking for an ultralight reel? Or the best spinning reel for trout? 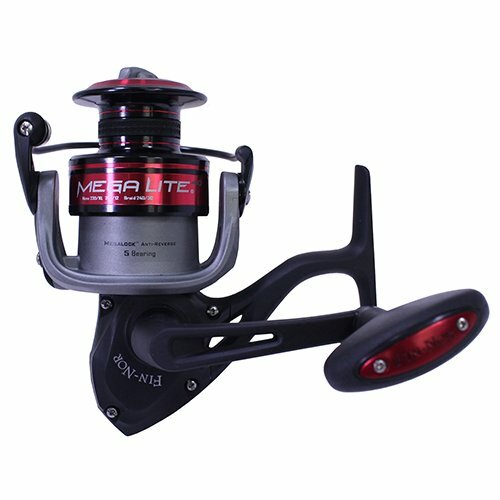 Or the best spinning reel 2018? Here is an ultra light reel for you, Okuma Safina Pro Spinning Reel. This tiny reel is a great one for start, even the little anglers can use it easily because of its ultra-lightness and smoothness. There are authentic reasons behind choosing it for bass fishing, let’s find out! Okuma, this Japanese company has already earned the title of the best spinning reel 2018. This Okuma Safina Pro series is made out of the highest quality materials, it has a graphite body which is exactly for corrosion resistance. That means it opens the gate of chances to fish in saltwater! Reel with a graphite body can go a long distance in any kind of waterbody fishing. They don’t compromise in quality, so no further argument about that. Let’s see the specifications. It has a good variety of size, you will find SPa-10, SPa-25, SPa-35, SPa-50, and SPa-65. The built-in quality is all same whatever the size is, but there is some little difference in gear ratio, ball bearings and drags. In common, it offers Multi-disk drag system which is really reliable in practice. There have Japanese-oiled felt drag washers, quick-set anti-reverse roller bearing available, corrosion-resistant graphite body, Machined aluminum, 2-tone anodized, RESII: Computer balanced Rotor Equalizing System and S-Curve Oscillation System. All these offer a great performance tested by the professional several times all over the world. Now if we give a detailed look, SPa-10 is an ultra light one from this series which offers 4-stainless steel ball bearings and 5.3.1 gear ratio, the line capacity that you can cover with this one is 2 lb.-210 yds, 4 lb.-110 yds,6 lb.-70 yds. You can go for small fishing with this ul reel and a ul rod with it. For greater line capacity, drag pressure you can go for SPa-50 or SPa-65. It offers better line capacity and 22lbs of maximum drag! Also has 3 ball bearings. And in Spa-50, you will get 3 bearing+1 roller bearing. The gear ratio is 4.8:1. For bass fishing I prefer the SPa-25, you will get a gear ratio of 5.3:1, the fastest gear ratio offered in this series. Perfect one for bass and also considered best spinning reel for trout, panfish etc. Try it, it won’t let you down. Description: Another good choice for little and medium-sized game fishing, reel fish 10-30 lb easily with this Fin-Nor Mega Lite Spinning Reel. Yup, it’s a megalith spinning reel especially made for a good startup. 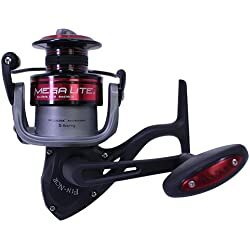 Due to the easy mechanism, spinning reels can be widely used by the child and feel free to give it to your little anglers hand because of its mega lite option. It’s constructed with graphite and aluminum built side cover which is the reasons behind its lightweight. Though it’s lightweight but has a rigid construction and also ensures great corrosion resistance. It has a sealed mega drag system, 4 stainless ball bearings. They used a mega lock anti-reverse system, braid ready spool. It’s available on 40, 60 and 80 in size. I would recommend the 40 or 60 sizes for bass fishing. With all those features, you can get a gear ratio of 4.9:1 which is almost 5:1. Perfect speed for bass fishing and some other small and medium-sized fishing. Want to know what’s the best thing i love about it? It’s a strong reel with awesome features within a very affordable price. So, if you are planning for a reliable reel in a cheap price, go for it! Description: If you ask me, which reel I would buy from this article then my answer will be undoubtedly the Penn Battle II Spinning Reel. Yup, it’s one of the best saltwater spinning reels in the market available now in such a good affordable price! A novice or a pro angler, it’s one of the best options you got in terms of durability, price, and performance. Penn Battle II is actually the updated version from Penn Battle series. It’s ultimate durability and extremely marvelous performance in big saltwater game fishing is the reason behind its verse popularity. Its body is fully metallic including side plate and rotor, it got a heavy-duty aluminum bail which works superbly offers unique durability. I’m a huge fan of their HT-100 HT-100 carbon fiber drag system which provides a really dynamic drag maintaining awesome smoothness! It has a super line spool, the cool fact is there’s a rubber gasket, fully braid ready. You can spool your entire reel with braid without putting mono, cool isn’t it! There are sizes varies from 1000-8000, 2500 is the latest addition they offered with some extra unique features. It offers a 6.2:1 gear ratio, 5 ball bearings with the instant anti-reverse bearing system. Pretty fast to reel with it, great for bass fishing! Now what’s unique about all these Penn Battle II spinning reels is with great built-in quality and extreme durability it offers you some of the finest features that you could barely get from other reels in the market! Saying about uniqueness, it has a 5 sealed stainless steel ball bearings and instant anti-reverse bearing, what that means is it’s extra protected by a fully sealed protection system from the water. In the previous versions, they offered 5 stainless shield ball bearing system which was covered by a layer but here in this latest model, they have a sealed extra cover for more protection from saltwater. Most of the cases, anglers repair their spinning reels for penetrating saltwater into the bearing issues. If there’s saltwater inside the ball bearing then it dries and then make the whole system rough, makes an irritating sound and destroys the smoothness of your reel. So now this is protected from saltwater, no chance of getting salt inside! This feature let you fish from the boat, kayak, floating tubes, peers even when you are in waders. These situations make you more contacted with water, but with a Penn Battle II, you will win the battle with a harsh environment. Another big change is, drag system gives 20% more drag than previous versions. Really wonders me this much drag from an ultralight spinning reel. Another cool feature is it’s got a line capacity line, which is basically a indicator that indicates you how much line you used and how much you left on your spool, pretty cool! For bass fishing, i would prefer the Penn Battle II 2500 size spinning reel. Don’t think twice with this one folks, just grab it and win the battle out there ! The full metal construction is perfect for enduring slapdash handling. The HT-100 slammer drag system produces utmost drag range and smooth reeling action to overcome even the fiercest game fish. Description: Shimano is one of the leading contributors to sports fishing equipment. The company provides a vast range of reels, and fishing accessories for modern anglers and has designed high-efficiency fishing tackling gear. The Shimano Sedona Freshwater Spinning reel reflects the company’s precision and class manufacturing capabilities. 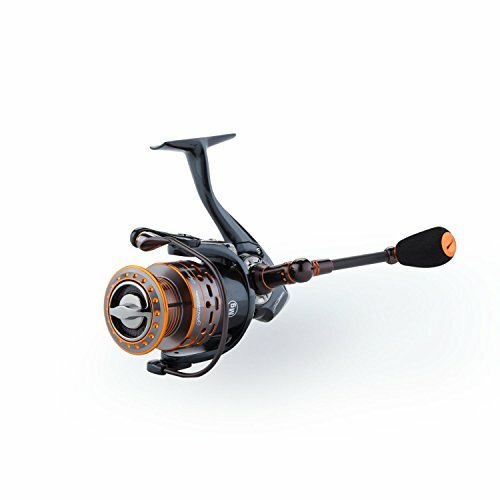 The reel instigates an attractive value with an innovative design and cold forged Hagane gear which provides an array of a noteworthy functioning overhaul. To increase casting comfort and lessen exhaustion, the center of the reel of gravity gets relocated closer to the rod. Thanks to its G-Free Body Technology. It allows the angler to hunt for a long time without stressing their forearm. After thousands of casting tests and computer simulations, it has been confirmed that the new Propulsion spool lip allows longer casting distance while preventing backlashes and the formation of wind knots. The oval oscillation gear provides a consistent spool speed and even line alignment that results in superb castability. The increased gear ratio of Sedona lineups has the ability to handle from light freshwater to heavier offshore fishes in larger models. The reels state-of-the-art technology will give you the sensation of smoothness and an everlasting passive experience. The gear teeth aren’t ground rather than the total surface is calculated in detail in less than a minute using special 3D design and then configured by Shimano’s cold forging technology thus making the reel resilient and durable. My recommendation, if you are just new to the fishing game, opt for budget ones. And for those regular anglers, select between the higher models to fit your demands. Description: My other favorite one, Pflueger Supreme XT spinning reel. It really blew my mind when I unboxed my one with its awesome look. But of course, that didn’t make it one of the finest! Let’s check out why it’s of the best option. The very first thing that will surprise you is it’s got 10 ball bearing system. Yup, you saw right, 10 bearings! Imagine how smooth is that thing! All the system is Corrosion resistant stainless steel ball Bearings so go for even kayak fishing in any kind of water, it won’t be a problem. It has a feather-light design what they say, a new Magnesium body and rotor. It offers a Carbon handle which is 21 percent lighter than aluminum. Definitely worth it a try! It also has a braid ready spool like the Penn Battle, just use braid line in the spool without using Mono. It offers you a 6:1 gear ratio, pretty fast isn’t it! It’s got a unique feature which is pretty amazing, the Sealed carbon drag – sealed system, the whole drag system is sealed gives a drag of 10 pounds. I would say really good drag at this affordable price. If you want a lightweight setup where you use a lightweight rod, artificial lures like crank baits, spinners, swim baits, topwater baits and won’t go for a bass fishing this is the reel you are looking for! With all the advanced drag system, 10 ball bearings and 6:1 gear ratio you can enjoy the ultimate smoothness with this Pflueger Supreme XT spinning reel. Just remember to rinse it off after every saltwater fishing, and there you go a long distance with it! Description: Daiwa revros-2500H is probably the best freshwater spinning reel into this price range. There are some mind-blowing specs what I couldn’t even imagine at this price. Always Daiwa offered something extra from most other fishing reels and this one continued with the tradition. Its body is made out of aluminum and stainless steel, the spool weights a couple of ounces. In my opinion, the only downside is the drag system cover is made out of plastic, which they did for a decrease in the weight. The drag system is perfectly constructed resisting itself from rust, it’s so smooth which is the best fact of this spinning reel. This gives you 8(7BB+1RB) ball bearings system, 5:1 gear ratio which is the perfect speed for catching basses and other fast fishes. The 8 bearing system is the reason behind its super smoothness, you can perform a smooth cast without any noise for a long long time. I found this even better than some expensive reels out there which hadn’t this much smooth. It’s not braided ready, but for bass fishing, all you need is monofilament line so it’s not going to be a problem for you. I prefer using Daiwa revros-2500H in freshwater mostly, cause though it has greater ball bearing system but not that sealed protection for the extreme harsh weather where it can save the ball bearings from salt. But in freshwater, it’s the piece of gem. 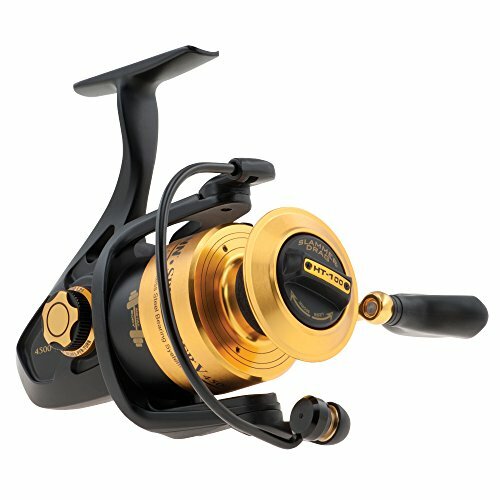 Description: Also known as the best spinning reel under 50 $, Okuma Trio gained popularity for its affordability. It’s a power packed one in a tiny version. They engineered perfectly this reel with power and lightness both which is a rare combination you could find in the market. This reel is made out of utilizing both the graphite and aluminum to increase the strength and decrease the weight. Like their hybrid body, the rotor is also made out of hybrid aluminum and graphite, you can feel the rigidity while fishing using it. Wanna know what makes it apart from all other spinning reels out there? They introduced the SRS or salt reel stream system which makes it a real deal. It’s a warrior in both saltwater and freshwater. I’m really a big fan of their drag system. Always Okuma tries to deliver something different, extra and innovative from other reels out there. Keeping that in mind, they offer Dual Force Drag System (DFD), Incorporates both surfaces of the spool to maximize high-end drag pressure, efficiency and overall smoothness. Their aluminum drag chamber is so smooth, completely sealed to protect the shaft, there is a dual drag system inside the drag chamber which really creates a good amount of drag. Want to fight with a big blue water fish? Yup, it’s possible with this reel. It secured its place among the best saltwater spinning reel. One of the major difference between an Okuma trio spool and other spool is, their spool is made out of a combination of graphite and aluminum which again produce a lot of strength in a lightweight package. Can’t get that in any other budget reels, folks! To maintain the ultimate durability and extreme smoothness, Okuma trio has 10 stainless ball bearings (9BB + 1RB), to be honest, it’s really super smooth like silk! There’s quick-set anti-reverse available, you get this reel in 3 sizes. There are the 30S, 40S, and 55S. The 30s are for lightweight tackle small sized fish, 40s is for small and medium-sized fish and the 55s is for bigger size fish with greater drag and line capacity. I prefer the 30s or 40s for bass fishing, you will get a standard gear ratio which is perfect for bass fishing. 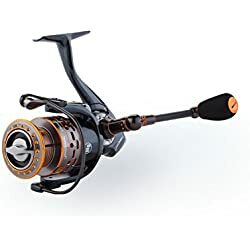 So, in short, if you want a highly durable, powerful, super smooth spinning reel in an ultralight version both for saltwater and freshwater and one of the best bass spinning reels under 100 bucks then this is exactly the spinning reel you are looking for. We did the best possible market research and caught some of the best bass spinning reels out there! But you know what, owning a spinning reel is not a big deal, you can afford anytime! It doesn’t even matter which one you got, is it an expensive one or inexpensive? Don’t be so much bothered with those questions! What really matters is, Fishing with it consistently! Owning fishing gears are just the beginning, only practice, practice and practice can make you a Maestro angler! The more you fish, the more you can gather experience and learn about fishing. Sometimes it can be a bad day, you won’t get any catch! It’s very natural, folks! I faced that a lot of time but every time that happened I came back with some effective experiences! That’s the best part of failure, it teaches you something. So grab any of the spinning reels from above, our job is done by choosing the best spinning reels for you, now it’s your turn! Happy fishing, folks.